How to play: Players need to collect train car cards to claim railway routes across the map. The longer the routes, the more points they earn. Additional points come from fulfilling destination tickets that connect distant cities. There are a variety of editions now out, each mapping a different country, continent or area of the world. My favorites are the original USA and Märklin maps, respectively. Why it’s fun: The rules the game is not complicated so you can play it with your family and friends of all ages. Also, it’s an exciting game as you have to act quickly so that you can occupy the ideal routes on the map! How it’s good for your brain: It’s a game that can train up player’s strategic and logical thinking skills. Also, some of the maps are historical so you can build upon your knowledge of geography in the past and present days by playing the game. How to play: Players take turns to use their myriad of army units to attack each other, take over territories and fortify their existing ones. To win in the game, players may also need to form or dissolve alliance with each other strategically to maximaize their occupation of territories. Why it’s fun: The game is a great imitation of warfare in which you make all sorts of decisions promptly. It’s pretty hard to predict who is the winner as the game is a combination of strategy and luck. So you need to fight till the last moment to know the result! How it’s good for your brain: Risk will definitely give your brain a work out because—like so many other games on this list—it’s all about strategy. It also builds your logical thinking and decision-making skills because everything you do has consequences. As such, the ’cause and effect’ gameplay is highly beneficial to building your intelligence. How to play: Puerto Rico is a role-playing game. Players take turn to draw a role card, like “traders” and “builders”, and have to take actions appropriate to the role. The one who can make the best use of different roles to gain the most resources to either export goods or construct buildings will be the winner. Why it’s fun: There are a variety of ways for you to trump your competitors in the game. You can choose to produce a lot of goods, keep constructing buildings or striking a balance between these two for victory. So you will never feel the same way even you play several rounds of the game in a row! How it’s good for your brain: Being a strategy game, Puerto Rico is great for developing your strategic skills. It forces you to think ahead and weigh up the consequences of your decisions. In addition, the game has a fair amount of rules and gameplay that you have to get your head around, which helps strengthen your mental capacity and multi-tasking skills. 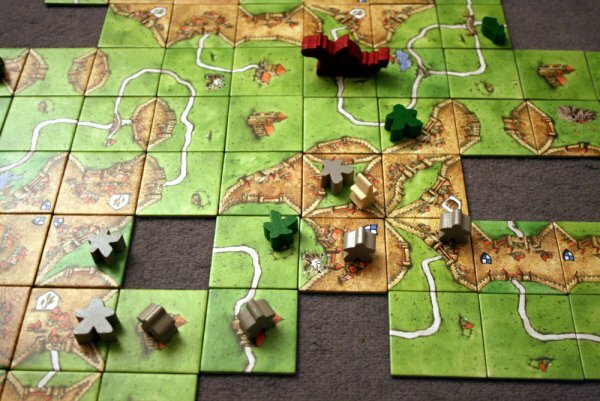 How to play: At its core Carcassonne is a game in which players need to place tiles depicting a French landscape. They also have “meeple” that they can use to claim castles, land and roads. Why it’s fun: It is a simple game that people of all ages can easily pick up. But to be a master strategist of this game, you need to identify the traps and possible wrong decisions you might make throughout the process. How it’s good for your brain: The game requires players to think logically about their decisions, particularly when it comes to meeple placement, as well as to strategize against their fellow players. How to play: Unlike other board games, this game requires players to be cooperative instead of competitive. Each player will play the role of dispatcher, medic, scientist, researcher and operations expert respectively. The ultimate goal is to find out the cures before the four deadly diseases break out in the world. Why it’s fun: It is a difficult game. Players can hardly find out the cures successfully in the first few attempts. But it is an interesting experience for you and your family and friends to put your heads together to figure out something intellectually challenging. How it’s good for your brain: As well as helping you to build your problem-solving and strategic skills, Pandemic teaches players teamwork and cooperation. This may not sound like a way to make you smarter, but interpersonal skills and the ability to cooperate and compromise are imperative to most jobs in the real world. Overlooking social-skill builders isn’t particularly intelligent. How to play: The aim of the game is to be the first to collect 10 timeline cards, each of which contains an historical event and the year in which it occurred. During your turn, you take a new card and put it in the correct chronological position within your own timeline. If you are correct, you keep the card. If you’re wrong, the next player can attempt to place it in their timeline. Why it’s fun: The level of difficulty of this game will increase as it progresses as the time gaps between historical events narrow. So it is a game with implicit time constraint – the earlier you get more cards put in the right chronological order the better! How to play: Dixit requires players to take turns being the Storyteller, who then makes up a sentence about one of the cards in their hand. Other players then select a card from their hands that they think best matches the aforementioned sentence. The cards are then shuffled, displayed face up and players have to decide which was the Storyteller’s. Why it’s fun: You will keep being surprised by how vague the cards you hold. And it is fun to hear how other players tell stories through the vague cards they hold! How it’s good for your brain: You have to be creative and original with your explanations and card choices, as well as make sometimes difficult decisions. As such, you’re required to utilize both the right and left sides of your brain. In addition, the game also requires you to read other people, which helps to build your emotional intelligence. How to play: Players need to draw two decks of card, which are “nobles” and “actions”. Sending the nobles cards to the guillotine is how players can gain points. But with the actions cards, players can disrupt the order and even steal cards from each other and make the result unpredictable. Why it’s fun: Despite being a relatively light-hearted game (regardless of the macabre topic) players need to use their cunning and strategy skills to try and execute the most people. Charming, I know. How to play: Each player gets a card with a secret word and draw something to represent the word on their sketch book. Then they pass their book to the player on the left and they need to guess what is drawn on the book they receive. This process rotates for several rounds. When everyone gets back their own book, they can see how things change created by miscommunication. Why it’s fun: You and your family and friends can’t help laughing when you compare how the last picture can be different from the original one. How it’s good for your brain: This game is a great boost of your creativity as you need to make use of your imagination power to describe some difficult and vague words shown on the cards and guess what others are drawing. How to play: The aim of Power Grid is to supply power to the most cities. To do this you mark preexisting routes between cities for connection, and then bid against each other to purchase the power plants. You must also acquire raw materials to power these plants. Problems may arise if you expand too fast and miss out on new technology. How to play: In Agricola you’re a farmer who’s responsible for feeding your family as well as building and expanding your land. You will lose in the game if you have trouble feeding your family so you need to compete with time and produce as many foods as possible in the game. Why it’s fun: The complexity of the game makes you feel like you’re running a real farm, and variables that can affect the result keep coming out throughout the process. How it’s good for your brain: The game is actually quite complex and requires a great deal of strategic planning and resource juggling for you to be successful. This makes it great for logical thinking and building problem-solving skills. In addition, it will help you to learn to multi-task and think ahead. How to play: Players sculpt the shape of an object or a living thing with the modeling clay and need to guess what the Dohdles other players make represent. Why it’s fun: It’s interesting to see how the imagination of you and your loved ones are demonstrated through their “masterpieces”! How it’s good for your brain: This game is good exercise of your imagination. How to Play: Two players take turn in placing their pegs in any vacant holes on the board and you can add or remove your own links between pegs. Each of the member tries to block the other player from connecting one’s two sides of row and the first one who did will win. Why it’s fun? It is easy to understand and could be play by kinds from 11-12 and it does not take much time, perfect for those who get boring easily. How it’s good to your brain? This helps improves your logical and strategic skills as you would have to think about how every move will be and should be connected from the start of the game. How to Play: Every player represents the seven European countries, and are required to use their armies and fleets to conquer as many European countries as possible. Why it’s fun? The game involves a lot of history and geography about Europe and players will have to decide for themselves to trust or to lie before the start of or in a war. How it’s good to your brain? It is not difficult to know how to play the game and it requires one’s logical and strategic skills as well in order to form possible alliances with other countries etc to train their own thinking before making any move. How to Play: You are the investigators who need to complete the story of a crime without oing insane. You draw 13 cards from 52 cards and stock your deck with at least 20 points of stories. When you completed the tasks required for a card, you gain points for ‘sanity’ and than when cards ran out, you come out and draw 13 cards more. Why it’s fun? It is a story investigation which might easily trigger players’ interests and opponents can actually intervene with their moves making the game very interactive and fun. How it’s good to your brain? One would have to use their logical skills to guess out the story of the crime and think of the ways to intervene their moves to keep them from winning.